Darius Heyward-Bey to Remain in the Steel City | "IT'S A STEELERS WORLD"! Last season Darrius Heyward-Bey approached free agency wanting to make a change. After four seasons (2009-12) with the Oakland Raiders and one with the Indianapolis Colts (2013), he was ready for another new challenge. He signed a one-year deal with the Steelers last April, coming in to hopefully make an impact in the passing game and basically do whatever he could to contribute to the team goal, making it to the Super Bowl. “I love this sport and I love to win and I want to go to a Super Bowl and that is what this team is all about,” said Heyward-Bey last April. This year when free agency rolled around, and Heyward-Bey once again hit the open market as an unrestricted free agent, he did so with a whole new approach. He didn’t want a change. He wanted to remain in Pittsburgh and continue the quest for the team’s seventh Super Bowl championship. He got his wish. 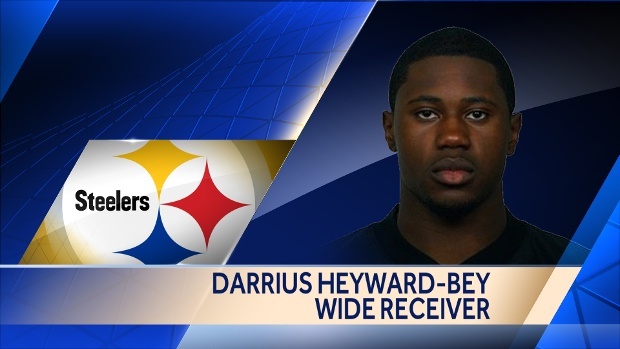 Heyward-Bey signed back with the Steelers, agreeing to a one-year deal. “It’s great to be back,” said Heyward-Bey. “I just wanted to stay here and be a part of a great organization and play for a great coach. That is what Coach (Mike) Tomlin is. I wanted to be back. For most guys free agency is tough, but I knew what I wanted. I knew the timing would take a little bit. For some guys it’s tough dealing with the unknown, but I knew what I wanted. Heyward-Bey, a starter for most of his career, took on a different role when he arrived in Pittsburgh last year. With Antonio Brown and Marcus Wheaton already in place, and the addition of rookie Martavis Bryant and Lance Moore last year, there weren’t a lot of passes to go around. Heyward-Bey had just three receptions for 33 yards last season, but those stats define his contribution to the team, though. Heyward-Bey, a former No. 1 draft pick in the league, did what many former starters and number one picks don’t do in the NFL. He made a huge contribution on special teams. Heyward-Bey has played in 88 regular season games with 65 starts and played in two postseason games. He has 172 receptions for 2,413 yards with 12 receiving touchdowns during the regular season. He wants to bring more to the offense this year, and with the release of Moore earlier this offseason, he is willing to do whatever he can. “I want to add a little bit more toughness than I did last year,” said Heyward-Bey. “I started doing that later in the year last season. I want to add speed, toughness. I want to add more tackles on special teams.